Amb. Carlos C. Salinas, Mrs. Isabelita T. Salinas, and volunteers at the Philippine booth. 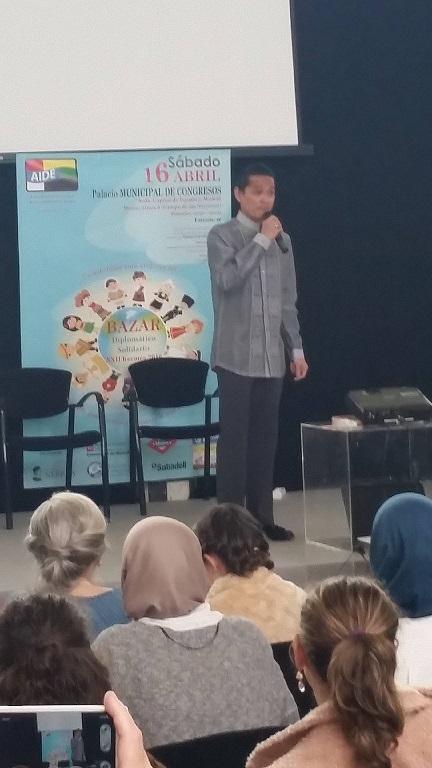 The Philippine Embassy in Madrid participated in this year´s Bazar Diplomático Solidario XXII Kermes 2016 on 16 April 2016, at the Palacio Municipal de Congresos in Madrid. 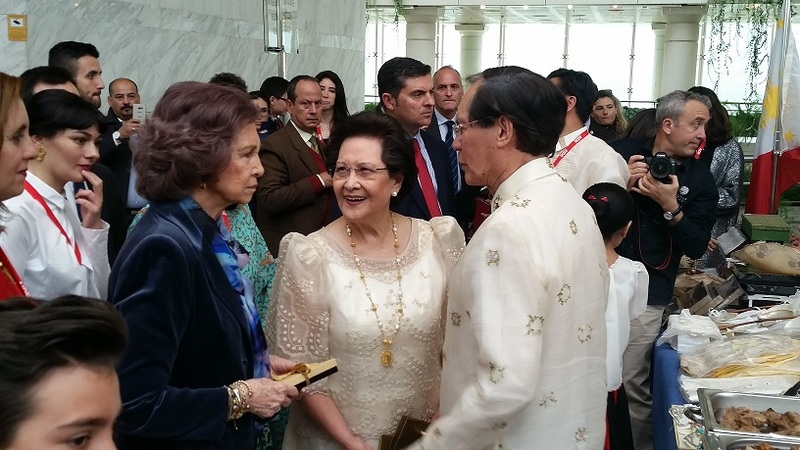 The Philippine participation was led by Mrs. Isabelita T. Salinas, wife of Ambassador Carlos C. Salinas. 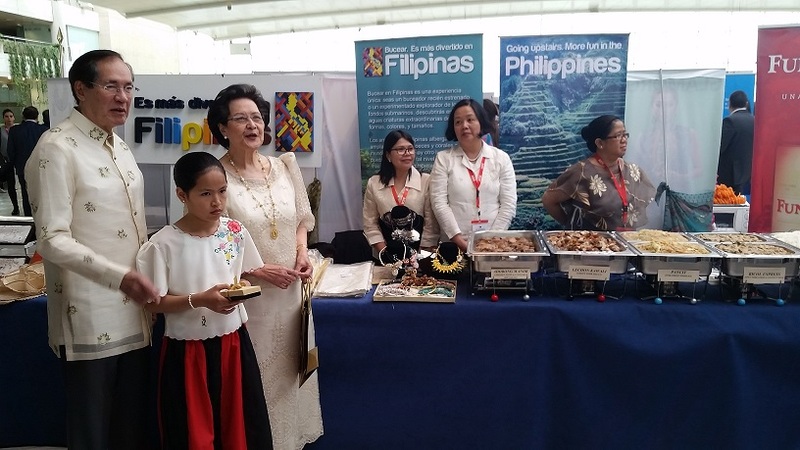 Ambassador Carlos C. Salinas and Mrs. Salinas welcomed and received Her Majesty, Queen Sofía of Spain, to the Philippine booth which showcased Filipino handicrafts made from mother of pearl, capiz, abaca, silk cocoon, etc. Typical and famous Filipino dishes like the lechon kawali, pansit, bicol express, and chicken adobo were also included this year, and were a hit among bazaar visitors. 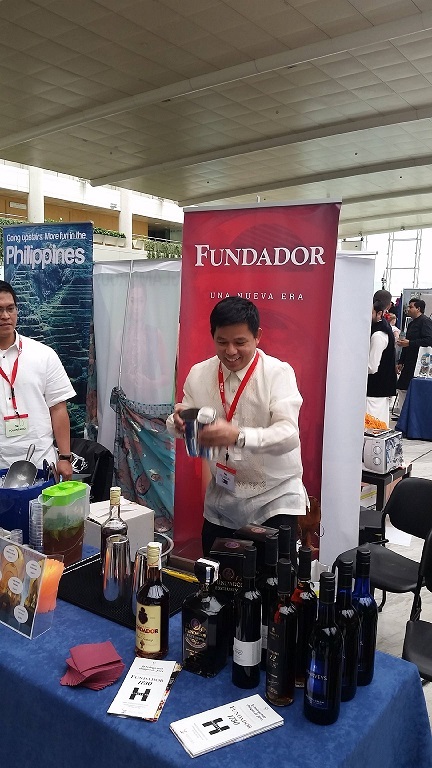 The Philippine booth also featured a talented Filipino bartender, Mr. Dennis Barela, who gave a sample of the art of cocktail mix performance using Fundador liquor products, now a wholly owned Filipino company. For the cultural program, a Madrid-based Filipino balladeer, Mr. Juancho Tanjutco, who sang To Where You Are by Josh Groban and the OPM hit Ikaw by Martin Nievera, was well applauded during his performance.Kermes is a one-day bazaar held every two years, organized by the Association of International Diplomats in Spain (AIDE), which is a non-profit organization composed of spouses of diplomats who are currently accredited to Spain. Its honorary patron is Her Majesty Queen Sofia of Spain. The international bazaar provides participating Embassies an opportunity to showcase their respective cultures through the sale of typical items and food of each country and a cultural show. There are 50 countries which participated in this year’s Kermes. Part of the proceeds of the bazaar is donated to the different charities under the Fundación Reina Sofía.